When Mauro came out of the kitchen carrying the polenta pot, pouring it directly on the table – we saw uncle Lino’s soft and nostalgic sight. Recalling his grannies times, when the family used to eat together the warm polenta served on a marble table or a wooden surface. Accompanied by several sauces, that was both a feast and a race: who will be the one to first reach the (only!) 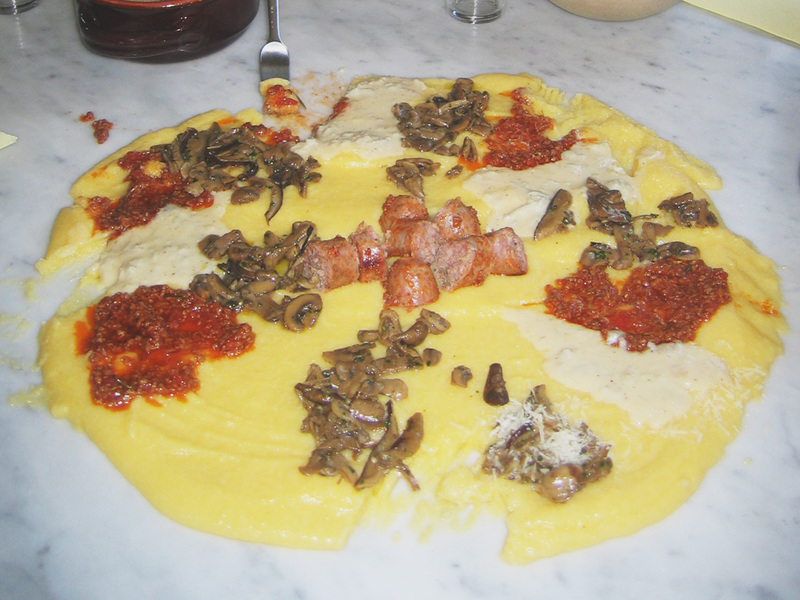 sausage that was placed in the middle of the polenta. Chop the onion, the carrot and the celery and fry it with the butter and the olive oil until onion turns transparent. Add the minced meat, let it cook for about 10 minutes, stirring constantly. Adjust with salt and pepper. Add the cup of red wine and cook for several minutes. Let wine evaporate, stirring constantly. In a bowl, work the tomatoes with a fork until mashed. Add the tomatoes to pot. Tie together 3 cloves with the wire, leaving one end longer ( in order to “fish” it out of the pot by the end of cooking). Let it cook on a very low fire for about 2,5-3 hours, stirring the ragu’ once in a while. Half an hour before end of cooking add the rosemary and the garlic. Before serving take out the rosemary copper, the cloves and the garlic. In a pot melt together the gorgonzola, butter and milk on a very low flame, stirring constantly. When melted, add the nutmeg and keep on cooking for 3 minutes. Serve warm. Cook the polenta according to given instructions. If not on a marble/Granite table or a large wooden surface, simply serve the sauces in large bowls. Optional: place one sausage in the middle, and invite your guests to race for that!.